20 minutes twice a day changed them. Meditation changed them. 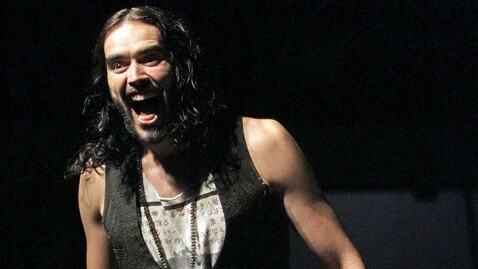 With his manic energy and cheeky vocabulary, British comic Russell Brand hardly seems like a poster boy for Transcendental Meditation. Mr. Brand was introduced by talk show host Ellen DeGeneres, who Mr. Brand turned onto TM a year ago, and in turn introduced David Lynch. Though best known to American audiences as the director of atmospheric films like “Blue Velvet” and the television series “Twin Peaks,” Mr. Lynch has also been an avid meditator for over three decades and created the David Lynch Foundation in 2005 to help implement meditation programs for both at-risk students and veterans suffering from post-traumatic stress disorder. Mr. Lynch summed up his thoughts about TM by producing a painting of a tree and explained to the audience, which included actors like Marcia Gay Harden, Kristen Bell and honoree Russell Simmons, that the key to meditation was to “water to root” of the mind and “enjoy the fruit” of the ensuing knowledge. He also introduced his psychiatrist Norman Rosenthal to the crowd, who thanked his client for his “confidential” introduction and explained the health benefits of transcendental meditation — a subject they have written about for The Wall Street Journal’s opinion page. (The included interview was from last year’s Change Begins Within Gala Event in New York City. You can see this year’s interview here, and the complete Third Annual David Lynch Foundation Benefit Gala, which took place December 3rd, 2011 at the Los Angeles County Museum of Art.) See Ellen DeGeneres and Russell Brand raise awareness about TM for overcoming traumatic stress. Ellen DeGeneres, Russell Brand, Russell Simmons, David Lynch and more. Meditating stars, leaders of veterans groups, and top scientists and educators gather to raise funds and celebrate the success of the David Lynch Foundation’s many outreaches to help people in need overcome traumatic stress and transform their lives from within. For more information on DLF empowering veterans, underserved youth, and other disadvantaged groups to overcome traumatic stress through meditation visit http://www.davidlynchfoundation.org. Watch News Conference View Event Photos. Watch a replay of this Benefit Gala, and other past events, at the David Lynch Foundation website. Also watch a replay of the David Lynch Foundation Launch of Operation Warrior Wellness Los Angeles, and related media coverage: David Lynch gives $1M to teach vets meditation. 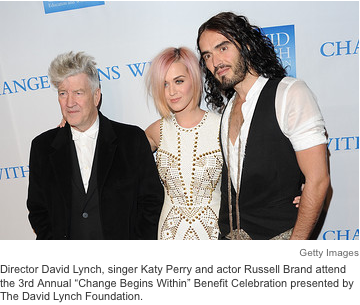 And WSJ: Russell Brand Interviews Quantum Physicist At David Lynch Foundation Gala. Leslie Hendry reviews David’s talk in How Hippie Meditation Helps Us All. See People Magazine photo of Katy Perry and her dapper husband Russell Brand make a cozy pair at the Change Begins Within benefit gala in Los Angeles on Saturday, and another one where Perry popped up at the David Lynch Foundation’s Change Begins Within benefit celebration in Los Angeles on Saturday. See Ellen DeGeneres and Russell Brand raise awareness about TM for overcoming traumatic stress.